Our Eating Around the World Adventure took us to Guatemala. I always ensure I make sweet dishes on our 'visits' not just savoury. This recipe is supposedly from a family recipe from a local Guatemalan cook. 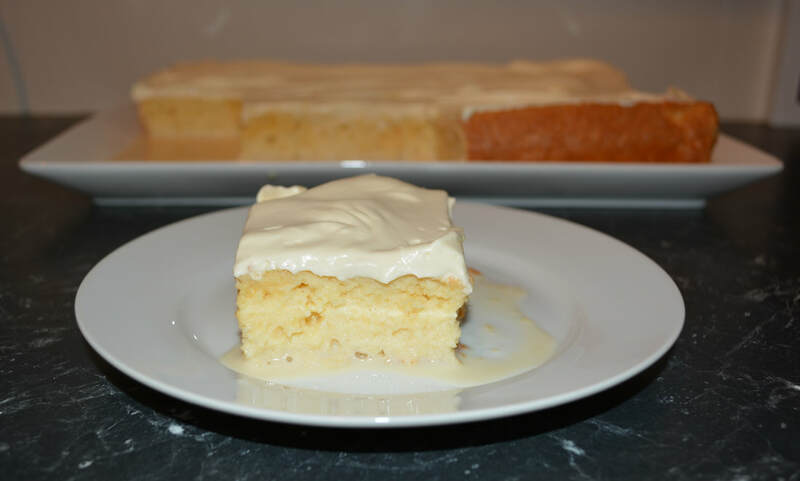 I came across this Guatemalan version of Tres Leches cake and as I already had a Mexican version that I loved, I thought why not try this version. Tres Leches Cake translates to Three Milks Cake. 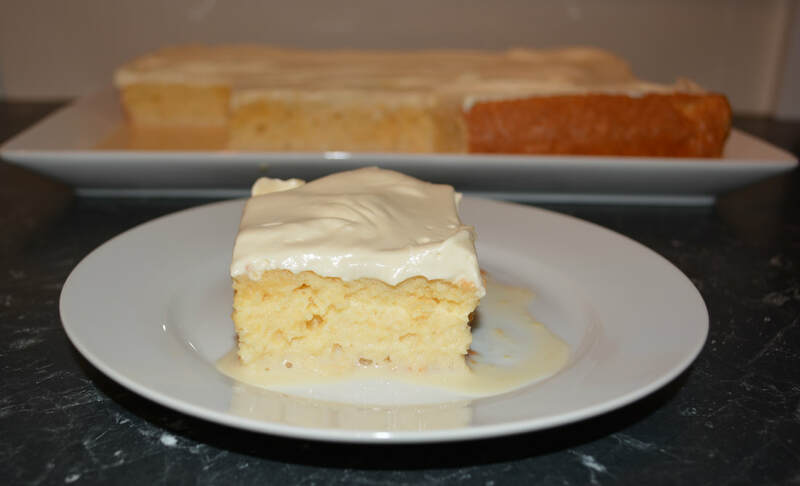 It is a super moist cake as after you bake the cake you soak it with a combination of three milks, full cream milk, evaporated milk and sweetened condensed milk. It is slightly sweeter than the normal cakes I make, but it does taste rather nice. This cake was lovely, it is more like a pudding after you drench it in the three milks, than a cake, but each slice you can cut perfectly, it doesn't fall apart, that amazes me every time. This makes a large cake, and is great for parties, as easy to slice and serve. Now with regards to presentation, I generally don't need super fancy plating, I am happy to soak it in the baking tin, then just slice and serve from there. But if you prefer to make it look fancier, you will need to place the cake on a high rimmed plate (so the milks don't run over the edge) before you soak it, as I don't think it is possible to move this cake once soaked. I placed it on a plate here, so it looks nicer in the photos, but normally I wouldn't. If you use a glass baking dish, you don't need to move the cake, as it looks great in a glass dish. If using a normal baking tin, and you want to present the cake on a plate, I like to line the tin with baking paper. I love the addition of cinnamon on the top, it adds such a nice flavour to it. So make sure you add it. But that is optional. One of the best things I did was start this eating around the world adventure, you discover new foods and it's fun. Give this cake a try, hope you love it as much as we do. Preheat oven to 175C/155C fan forced. Firstly make the cake: Put the egg whites in a bowl of an electric mixer with the whisk attachment. Beat the egg whites until stiff peaks form. Set aside. In a clean mixing bowl, add the egg yolks. With the beaters on medium speed, slowly add the caster sugar, beat until combined. Reduce the speed on the mixer, add the vanilla and rum. Slowly add the plain flour and baking powder. Once combined, fold in the beaten egg whites using a wooden spoon, until combined. Pour the cake mixture into an ungreased, glass 33cm x 22cm baking dish. Bake in your preheated oven for approximately 25 minutes, or until a skewer inserted in the centre comes out clean. Meanwhile make the milk mixture: In a blender add the evaporated milk, sweetened condensed milk, full cream milk, vanilla extract and rum. Blitz until combined about 30-40 seconds. You could just do this in a bowl with a whisk. Once the cake is baked, using a fork or skewer, poke several holes all over the top of the cake, including edges. Pour the milk mixture slowly and evenly all over the cake. The holes allow the liquid to be absorbed by the cake. ​Allow the cake to cool to room temperature, then refrigerate for 4 hours or overnight. Just before serving, make the cream topping: Using a mixing bowl with a whisk attachment, add thickened cream, rum, vanilla and sugar, beat until you get soft peaks, do not overbeat, you just want it thick enough to hold it's shape once spread. Top cold cake with cream mixture and serve chilled.